This document refers to one or more of the options accessible by clicking your "Configure" menu item in your top menu when you are logged on as administrator, then clicking the "Administrator Access / Subaccounts" header item to expand the options. Subaccounts are the "special sauce" of the DoWellWebTools platform, and the vital component to your web empire. Statistically, a small percentage of websites actually succeed when measured by traffic or income. We can all dream big and delude ourselves in thinking that the one idea we have will make us millions, but reality has a different plan for us. Work within reality and realize that most of the websites you create will probably not do very much. We beat the odds by having multiple websites. It's like playing the lottery with multiple tickets. Another way to think of your web empire is like a Monopoly board. You will have a range of properties. Some will be equivalent to Baltic Ave where others will be like Boardwalk and Park Place. Sure, your first website may hit the metaphorical jackpot, but just in case it doesn't, you will have th rest of your web empire on which to fall back. With the DoWellWebTools platform, you can create unlimited subaccounts. Each subaccount has to be named with alphanumeric characters only (a-z or 0-9), can use MiXed CaSe, and will appear in the URL for all the tools under that account. Once the name it set, it cannot be changed (although it can be deleted and recreated), so choose your subaccount name carefully. The main account, by default, includes all of the tools, whether you use them or not. In the "Tools" menu, you will see all of the tools in the dropdown. Those that have a muted color have not been activated yet. Those tools that are not activated in your main account, will not be available to your sub accounts. This is how you can control what tools your subaccounts can access. So if you want all the tools to be available to all of your subaccounts, make sure you activate all the tools in your main account. In the example above, there are 3 subaccounts. Sub1 has three tools associated with it, and Sub2 along with Sub3 have only two tools associated with them. Every subaccount created needs the Relationship Manager tool. This is the database tool that all of the tools use in some capacity. You (the main administrator) cannot delete the Relationship Manager for the main account, and the Relationship Manager's for the subaccounts can only be reset (i.e., all the data and configuration information removed), unless the entire subaccount is being removed from the master Relationship Manager. 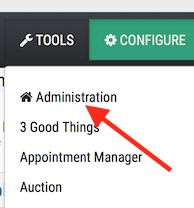 You can either navigate to your Relationship Manager through the "Tools" menu, or if you are in your administration tool, then look for the plus icon near "by subaccount", and click that to be taken directly to the subaccount editing area. Now that you are in your main account's Relationship Manager, go to "Configure" > "Administrator Access / Subaccounts". Simply enter the subaccount name you have chosen. If the name is valid, the field will turn green. If the name is invalid, it will turn red. Once created, scroll to the bottom of the page and click the "Configure" button. To delete subaccounts, you must first delete each active tool being used by the subaccount, then delete the entire sub account through the main Relationship Manager. To remove only a tool and the data for that tool in a subaccount, go to the tool within the subaccount and you will see the delete option under "Public Access".